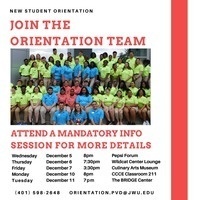 New Student Orientation & Support Programs is currently recruiting for OTEAM 2019. Joining OTEAM is perfect for students interested in developing their leadership skills, making a difference on campus and enjoy meeting new people and helping others. Learn more about the available positions, benefits and the application process at an upcoming info session. Please note! Students must attend an info session in order to apply for OTEAM.